Fall clean up in the front bed and a few relocations. | Arthur in the Garden. ← The Best Ever Banana Bread! Fall clean up in the front bed and a few relocations. I have a bad habit of purchasing plants from the clearance area of garden centers and really enjoy bringing them back to life. The problem is that once they recover, and begin to grow, I will often have to relocate them to a suitable location where they can thrive and have room to grow to maturity! The large oakleaf hydrangeas that you see in pictures on this site were purchased as half-dead twigs and now, five years later, are huge! You would never have guessed I paid only $3.00 for them! 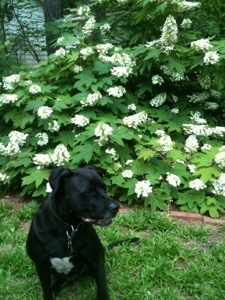 Oakleaf Hydrangeas and Gus above. This habit has filled the front bed with a collection shrubs, saved from the clearance aisle, and wildflowers from end of season seed packets. The majority of Friday was spent moving some of those now well-rooted cuttings and clearance sale finds that found my garden favorable. Below is a picture of the North side of the bed looking toward the house and the parking area. 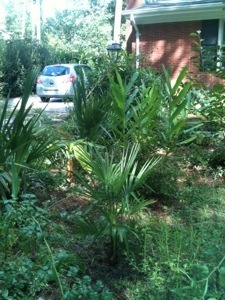 It has been filled with clearance palms, a Asian magnolia, and ginger lilies. I think this clump of ginger lilies came from someone’s yard waste pile I saw on the side of the road? These will not be moved and will create a nice buffer to the driveway and parking area. First, I decided I wanted to have a path of wildflowers leading from the walk in front of the porch to the street-side of the bed. This involved moving a French hydrangea and a Witch-hazel which both were salvaged from the clearance area of a local nursery. 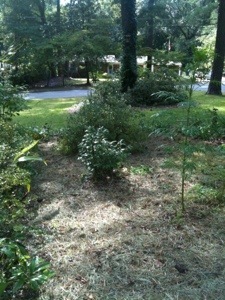 I then mulched the cleaned future wildflower path with dried grass. 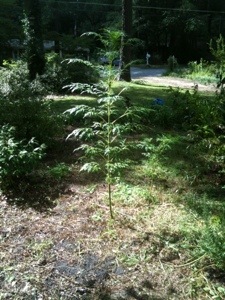 I left a few, very tall cosmos that were volunteers from past years. They will be loaded with orange flowers in a month or so. They are about 5 feet tall and look amazing when they are covered with orange blooms in the Fall. The picture below is looking West toward the street from the front porch after I moved the shrubs leaving the lone cosmos. The future path is mulched with dry grass which will decompose into the soil and also help prevent the germination of weeds. I had already planted a few rosemary plants to mark the beginning of the path over the Summer. They will stay where they are. I also left an azalea and a cutting of a burning bush that had rooted. They will be moved later. I’ll have to find a home for them somewhere in the yard or give them away. I will plant this path with coneflower and other wildflower seeds soon. I hope in the future, it may become a new sidewalk or a stepping stone path from a future circular driveway. Right now, in my mind’s eye, I can see a swath of wildflowers next Summer followed by many seedheads full of seeds for the birds in the Fall! Hmm, maybe I will add a few stepping stones this Winter so I can have a convient way to walk through the wildflowers next year. We’ll see! On the order of found objects: I often find things buried in the yard of this 42-year-old house. 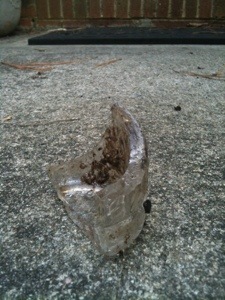 This time it was part of a thick glass bottle that was buried about a foot deep. It has some sort of braided design but no identifying names or marks.